The mako shark has a reputation for being one of the deadliest killers in the world's temperate, tropical, and sub-tropical oceans and seas. With jaw-dropping speed, this lethal predator sinks its sharp teeth into its victim’s flesh, making escape nearly impossible. 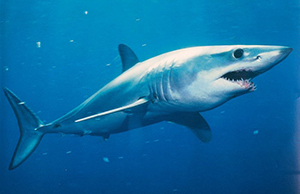 Mako sharks can grow to over 12 feet in length and typically weigh over 992 pounds. This vicious creature preys on fish like tuna, squid, and mackerel, even though it is a part of the mackerel family. Because the mako shark is smart and learns new ways to attack its prey, sport fisherman love the challenge of hunting and capturing it. Records indicate there are about 50 reliable reports of shark attack each year, due to the mako shark. However, experts generally agree that tiger and bull sharks, rather than mako sharks, are actually the real perpetrators. Experts are unsure how long the lifespan of the mako shark is, but they do know that this species remains in waters cooler than 61 degrees Fahrenheit. So, if you are ever in the cool sea or oceans, watch out!